يشكل Ibis Budget Auckland City بموقعه الممتاز في المدينة نقطة انطلاق جيدة لاستكشاف أفضل ما فيها من معالم ومناطق نابضة بالحياة. يقع مركز المدينة على بعد 0.1 km فقط. ويمكن الوصول إلى المطار خلال 30 دقيقة. يوفر العقار بفضل موقعة الجيد وصولاً سهلاً إلى أهم معالم المدينة.
. إن حسن الضيافة والخدمات الراقية التي تعرف بها Accor Hotels تغني تجربتك في Ibis Budget Auckland City. لضمان راحة ضيوفه، يقدم الفندق الخدمات التالية: خدمة غسيل ذاتية, مكتب الاستقبال على مدار الساعة, تخزين الأمتعة, واي فاي في المناطق العامة, مصعد . يمكن للنزلاء الاختيار من ضمن مجموعة من الغرف المصممة بعناية لتعكس جواً من الراحة، والتي يتجاوز عددها 143. كما أن مجموعة الخدمات الواسعة الموجودة في الفندق لضمان راحتك تترك لك الكثير من الخيارات لقضاء وقتك أثناء فترة إقامتك. إن كنت تتطلع إلى إقامة مريحة وهادئة في المدينة، فستجد في Ibis Budget Auckland City بيتك الثاني. 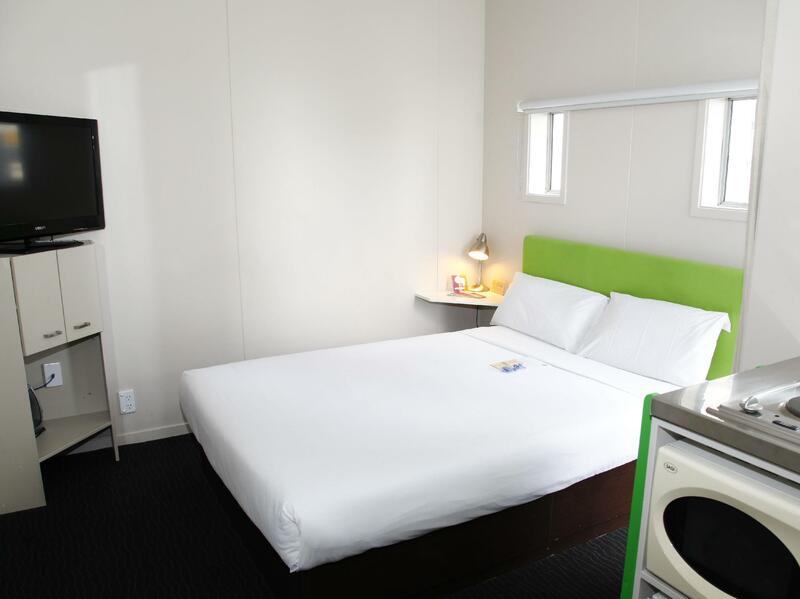 Good location in Auckland city center but with very tiny room and shower room. We put the dirty towels in the shower room but the housekeeping didn't collect it and just gave us new towels. Rather disappointing staying experience. I had a great stay here as i did in their branch in amsterdam. Great location, its at the heart of the city center. Sky tower , aotea square, wharf are just nearby. Easy to commute. Just take sjy us from the airport and stop at 7062 at queens st. I booked this hotel as I knew I wouldn't spend much time in the room that's why I went for a cheaper option in the city. I understand it is a budget hotel, and didn't have high expectation and all I wanted is a clean room. I found blood on my bedsheet and blanket cover. The staff said there was no cleaner worked at night time so they moved us to another room. Again, I also found dirt on my bed.....Budget doesn't mean it can be dirty. Good central location. Helpful and nice staff. Small, but clean room with a good bed. I stayed on the top floor to get away from cartraffic, and did not had any noise problem with traffic, but the construction work in the neighborhood will you hear. Breakfast, not much, but you get something to start the day on. Would stay there again. Cannot fault location - just off Queen St and close to everything including transport, supermarket, restaurants and retail. Hotel itself is absolutely fine - budget but clean and tidy. I get annoyed when people book budget places then proceed to complain about the things that cannot POSSIBLY be expected for the money they pay! It's ridiculous, and I'm sure most savvy travellers see through their pathetic 1st world ideals. If you want to stay in the middle of Auckland City with everything included then book a 4 or 5 star hotel - there are plenty available. And you will pay way more than the Ibis' rate. Ibis is fine - the bed was super-comfy, the place was clean, water hot and amenities adequate. I only rated it slightly down because the fridge in the room wasn't working. Otherwise it was great. 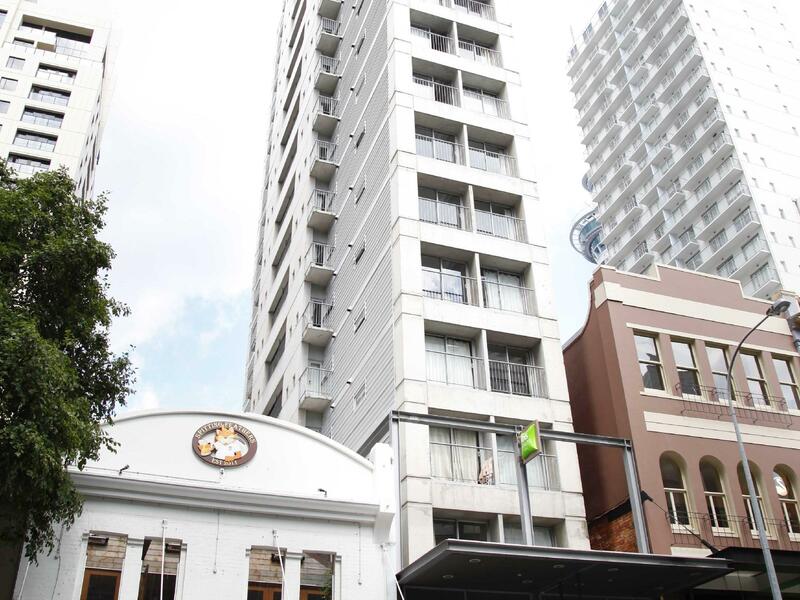 very centrally located, just minutes beside the skytower... and there's a nearby grocery which was also big plus... other than that it's just a regular hotel, all sights in AKL are outside the city itself so..
Accommodation is adequate for business travelers with no luggage staying one or two nights during cool weather. 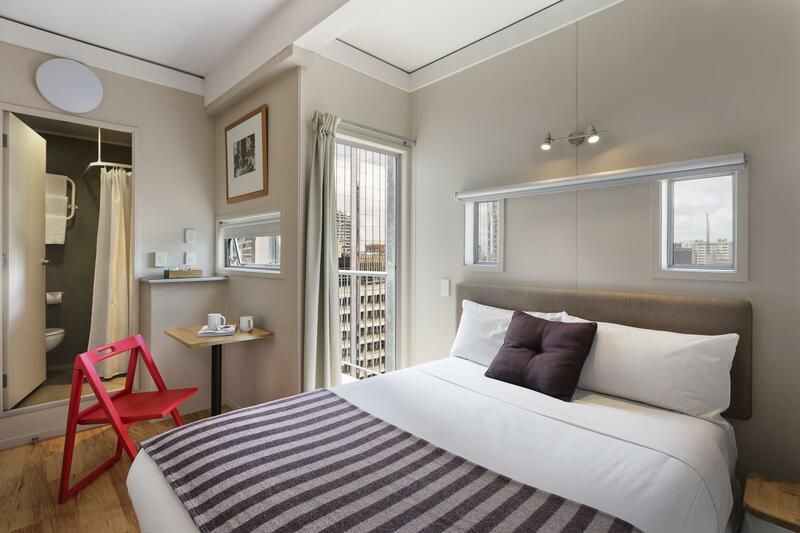 The room was clean enough, the bed was comfortable and the staff friendly and accommodating. However, there is NO AIR CONDITIONING and the room became stifling in the hot weather. Our room was very, very small. We were on holiday and had a large suitcase each which took most of the floor space. The only hanging space wass too high for me to reach (I am 5ft 2ins) and there is no other storage. 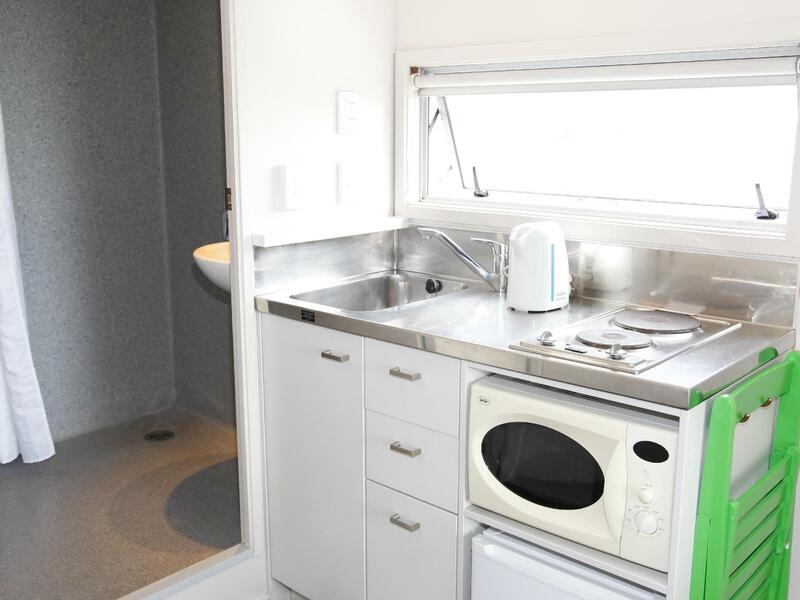 There is a kitchenette with no dishes or cooking utensils therefore there is clearly no intention by IBIS that it is actually to be used. The location wass extremely noisy during the day due to heavy construction equipment, and at night because of the nearby pubs, so resting or sleeping with windows open to let in cool air is impossible. The very small space and the lack of airconditioning meant that our stay was very uncomfortable. This was a last minute choice for me, but think it was decent value for what I got. The rooms are on the smaller side but worked for me (I'm 5'3). They now have hooks behind the door for you to hang your clothes. The toilet is very small and no partition so the whole floor will be wet. The only true downside for me is that construction is very loud and starts at 7 a.m. I got woken up by a super loud jackhammer. They also dont have blackout curtains, so it is still bright when you sleep I think there are other better value places, but if you want something easy and consistent, and you will get up early anyways, this is an ok place to stay. Stayed for a night in Studio Double Room. Cannot believe this is my first time writing a negative review of a place i stayed in many of my travels. Indeed it is a budget hotel and but it was a totally bad rip off budget hotel in my opinion. When first stepping into the room, i was greeted with rusty looking stove, rusted electric kettle (blackened-rusted metal coil heating element) - called the receptionist whom was prompt and kind enough to give me a replacement which i really appreciate the kind staff gesture. Dust clogged up the bathroom ventilator which practically just blows off the dust within the bathroom. Dusty beddings. No hairdryer. Overall a bad experience. Good location and the price are very reasonable. Just after mid-night, a bit noisy outside. 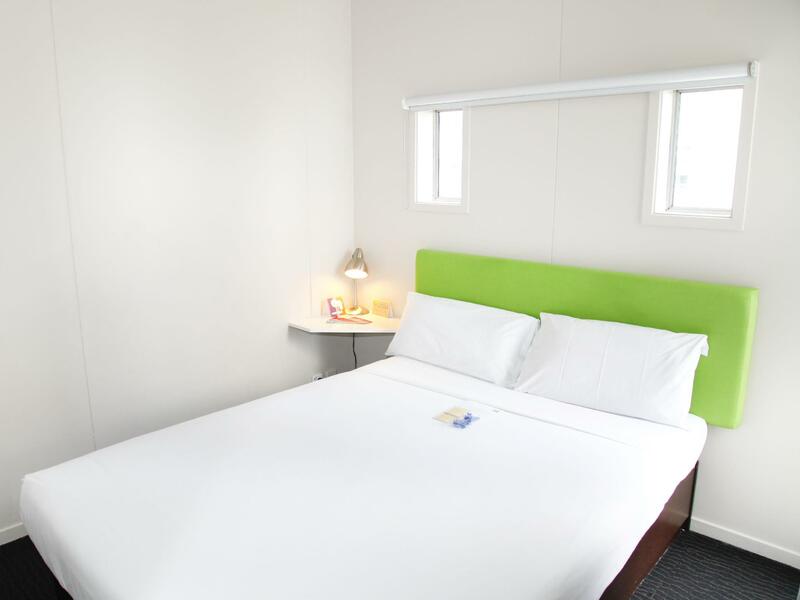 Best budget hotel in Akl. Nothing like the photos, much smaller. Great view however and perfect location for night out! The ensuite unit that i booked was just as the photos shown and as per described. Location was easy to find, and is located 3mins walk away from the Skybus's bus stop which we took from Auckland airport. Was suitable for 2 person, with just sufficient space for packing, as we were due on a plane back to our country. 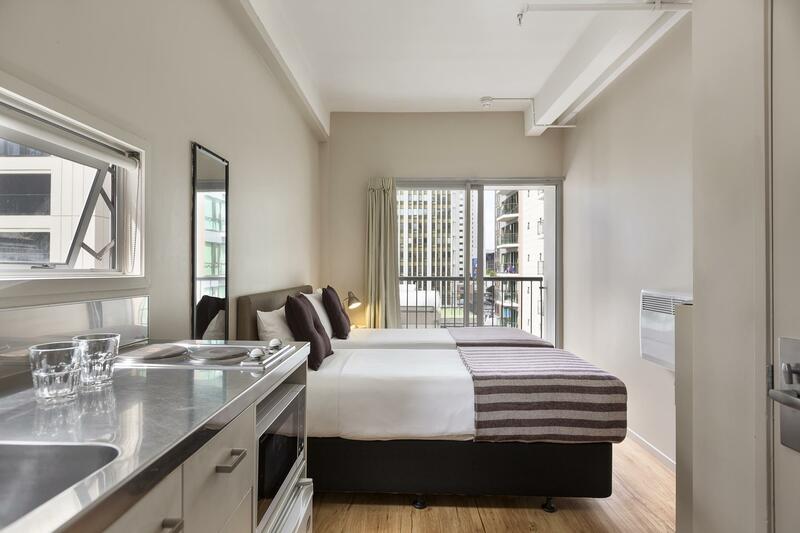 Perfect location in CBD, perfect for a good nights sleep for soemone who has a couple of nights to explore the city and wants a decent dependable and relatively cheap facility for the night. Room was not ready despite the check in time at 2 pm and took another hour but was informed of that in spurts so couldn't go out until checked in. The staff at the reception is very kind, nice and helpful. The rooms are 'ok'. It's better than the reviews here, but go there for a sleep and get out asap. The location is perfect, but what I do not get is why the room looks like a prison cel. The wall could have been painted in a color and a paining on the wall could have made it at least a littlebit better. Could be fixed for 10 dollar a room at IKEA! Anyway, it was good enough for a sleep. My second stay at Ibis was much better than my 1st. I had a very noisy room on the front on a weekend night previously. This stay was mid week and I had a very quiet room at the back. Location is central, rooms are small but comfortable, overall a good value. Overall, my stay at the Ibis was good. central location near Queen St. and the waterfront. There are lots of restaurants around. The rooms are small but comfortable, as usual in an Ibis. My only complaint would be the street noise. I was there on a Saturday night and the howling and yelling of drunken partiers kept going until after 2pm. Ask for a quieter room at the back of the building. Apart from the location, we found little to like about this hotel. Starting with our check in, where the receptionists had body outdoor that nearly knocked us off our feet. Coming into the room, we found the garbage not emptied and the toilet with stray hair inside. The bathroom had mold stains in the corners, and wasn't what we would have expected from an ibis hotel quality wise. Cleaning overall seems to be taken not very seriously, seeing as the floor was never cleaned during our stay. The bed was ok, but the room was hot in summer, with little way to cool it down - no aircon, no fan. Our only option was to leave the balcony door open, and even that did not do the trick.